The UW-La Crosse volleyball team was picked to finish dead last in the Wisconsin Intercollegiate Athletic Conference standings this season. Instead, the Eagles won their first conference title since 2003. The Eagles only won nine games in 2014, but returned its core group of players in 2015, and their improved chemistry has paid off. "We had good team chemistry last year, but this team is one of the most cohesive groups I've seen," head coach Lily Hallock said. "I think that really makes a difference, especially in those matches that are tight late. When you're playing a fifth set, you've got to be able to look at your teammates and trust them and that can make a difference." UW-L started the season off 7-2 after strong showings at the Saint Mary's Sugarloaf Classic and Augsburg College Invitational. That gave the Eagles some much-needed confidence heading into the WIAC season, where UW-L went 6-1 to share the title with UW-Oshkosh a season after finishing dead last. "The whole pushing each other and competitiveness increased and we had a lot to prove," junior middle blocker Jill Entinger said. "I think the whole process of getting from last to first is what helped us change." Cohesion played a big role too. The Eagles only lost three seniors in 2014, so the remaining group spent the entire offseason working together, pushing each other and reminding one another they had something to prove come next season. That is being reflected not only by UW-L's record, but in the stat sheets each night as well, as the team has five different players atop six key statistical categories this season. Senior Leah Putzier leads the team with 314 kills, Entinger leads the team with a .358 hitting percentage and with 357 points, senior Danica Johnson leads the way with 337 digs, and senior Jaclyn Barrette had 789 assists. 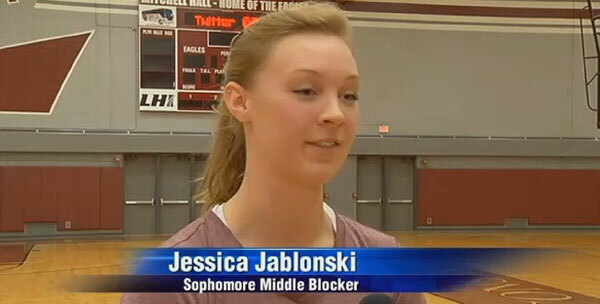 "This team isn't afraid to challenge each other, which is what makes it so great," said sophomore middle blocker Jessica Jablonski, who leads the team in sets played and blocks. "You're doing it for the team, you're making each other better, and that just makes it even more meaningful if someone is having an off day you can throw someone else in and you know they're going to get it done." "And even better, when everyone's on, and doing their job, it really comes together and that's what makes a good team," Putzier added. The 2003 championship team had a similar style. That Eagles team had four different players atop four different categories en route to a 33-6 record and a WIAC tournament championship. The 2015 team has a similar DNA, and is set to challenge for the conference tournament title this weekend in Oshkosh. UW-L will host UW-Whitewater in a semifinal match Friday at 5 p.m. at Kolf Sports Center.